Richard Morgan. A career singer, his renditions of Kipling's work made him world famous. Born in Portobello 1877, the second youngest of nine children. The family had moved to Portobello circa 1875, a small town between the ever expanding Wolverhampton and Walsall. The 1881 census show the family living at 12 Primrose Street. By the time of the 1891 census the family had moved to 35 Willenhall Road, a family of six living in two rooms. 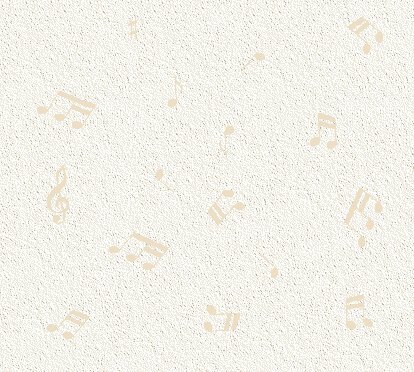 Richard aged 14 is employed as a professional singer of music. The performance dates mentioned in the timeline below are taken from The Stage, The Era and other newspapers, the dates are either a call to, show dates or revues. They are not a full reflection of his career as I am sure a number of shows, venues and dates are still missing. I still have orphan clippings indicating a Mr. C. Morgan in the cast, which cannot be verified as Clifford, so these have not been added to this career list. The location of Primrose Street. 31st May at St Georges Hall, Walsall for Messrs. Martland & Turner in My Sweetheart playing Harold Bartlett. 9th August an event called Old Gaiety re-opens at the Empire Music Hall, Wolverhampton. 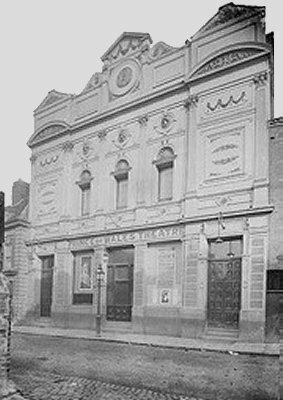 The New Theatre Royal was built on the site of a slaughterhouse in Bilston Street and opened as the Prince of Wales Theatre in 1865. Over the years it was known as The Star, the Hippodrome and the Clifton Cinema, or as it was known locally as 'The Blood Tub'. Growing up close to Bilston this would have been one of Clifford's local venues. 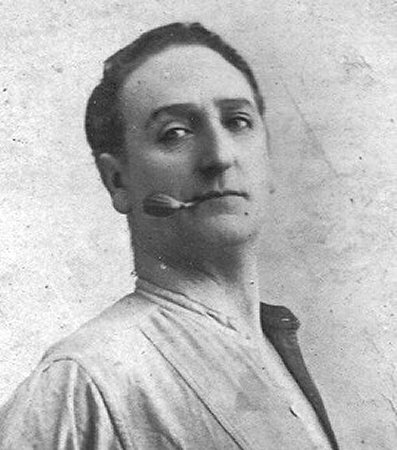 The Stage review of January 1897 notes Clifford as 'a native of the town', his role, Captain Pedlo in the play In Sunny Spain. In December of '97 he starred in the Christmas pantomime at the Lyceum, Crewe, as Father Time in Cinderella for Mr. J. R. Horrox's company. In December Clifford married the actress Nora Louise Moss, the daughter of Cheshire Moss, a Professor of Dance based in Oldham Lancs. At least two of Nora's siblings were also actresses. Nora was baptised the 13th April, 1875 at St. Wilfrid, Farnworth near Prescot, Lancashire. The marriage took place at Ormskirk. The Prince of Wales Theatre. Clifford then joined Miss Cissie Moxton's No.1 company. He played Thady Clancy in A Trip To Rum Fum. At Oldham a son is born, Walter Clifford Morgan, also known as Jack. At the end of July he joined Mr. Milton Bode's touring company. Clifford's relationship with Mr. Bode lasted for a number of years, whilst both working on other projects they would often work together. Bode was a native of Birmingham who began producing pantomime during the mid 1890's in Wolverhampton. Although seventeen years Clifford's senior it is possible that they knew each other from this earlier period. 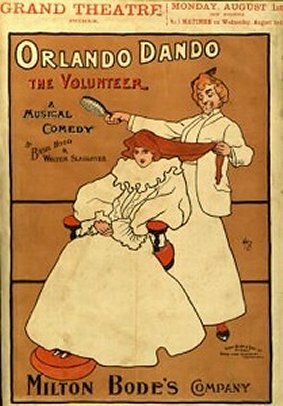 The first production was The French Maid, a musical comedy in two acts by Basil Hood, with music by Walter Slaughter. Produced at Terry's Theatre, London 24th April, 1897 then transferred to the Vaudeville Theatre, 12th February, 1898. Closed on 6th August, 1898. Touring began directly afterwards. Synopsis: Suzette has many admirers, including a jealous gendarme, Paul Lecuire and Charles Brown, a waiter at the hotel where she works. They are concerned by her impending choice of escorts to the forthcoming balmasqué. But things are further complicated by various visitors to the hotel who also call for the pretty maid's charms - an Indian Prince, his attaché and Jack Brown, and English soldier and twin brother to the waiter. 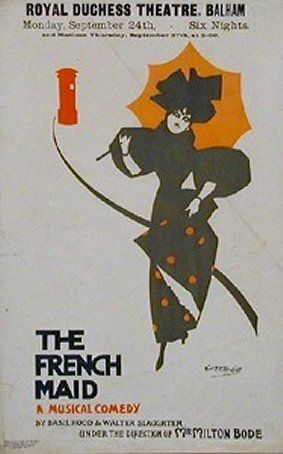 In traditional French style Suzette strings them all along, causing havoc in the lives of all concerned, including the aristocratic Admiral and Lady Hawser, their niece Dorothy and her lover, Harry, who gets involved in a second act full of jealousy, disguises and misunderstandings until all is disentangled and a chastened Suzette goes back to her faithful gendarme. Continuing with Milton Bode's Co. for the remainder of 1899 starring in Orlando Dando as Captain Hamilton. in Cinderella. His wife Louisa Moss played the 2nd girl. Louise played the role of The Princess for the next dates. Clifford played no character and therefore probably sung as himself at the J Horrox Benefit held at the Royal, Darwen. A variety show followed June 28 at the Queen's, Manchester where he certainly sang in his own name. A further tour with Mr Bode's The French Maid where he again played Lt. Harry Fife until the last two dates where he switched roles to Jack Brown.